Chinook Wines is named after the Chinook winds in the Pacific Northwest. The winery is located in Prosser. Husband and wife team Clay Mackey and Kay Simon are the nucleus of the winery with Mackey doing the viticulture and Simon making the wines. Both University of California Davis graduates, their paths didn't cross until they both took positions at Chateau Ste. Michelle. Chinook Wines was started in 1983. The couple released their first wines a year later, two days prior to their wedding. 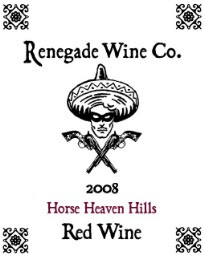 Renegade Wine Co.’s wines are brought to you by Trey Busch of Sleight of Hand Cellars. Renegade Wine Co. made quite an Internet splash earlier this summer by offering ‘mystery wines’ through Jon Rimmerman’s Garagiste (this is not one of these wines I should add). For his Renegade wines, Busch buys the juice and then does the blending. These wines generally punch above their price point. Desert Wind Winery makes a wide variety of red and white wines from its vineyards on the Wahluke Slope. The winery itself is located in Prosser. One of the wines sampled here is the first release of the Ora White Wine from the winery. The name is combination of aura and oro, the Spanish word for gold. The winery conducted an on-line Twitter tasting release event for the wine during the summer. Townshend Cellar is located in Spokane. Winemaker Don Townshend was first exposed to the wine world when he installed a cooling unit at Preston Winery back in 1979. In 1987 Townshend moved to Green Bluff, a town north of Spokane. Though Townshend originally hoped to make fruit wine, he found the costs prohibitive. Townshend Cellars released its first vintage in 2001. The winery makes over 10,000 cases and twenty different wines. Don Townshend also owns Spokane wineries Caterina and Lone Canary. Rating: + (Good) Light cherry red in color. Spice, strawberry, watermelon on a reasonably aromatic nose. Comes off as a bit frizzante when first poured. A fairly big, weighted palate full of fruit while still bone dry. Rating: + (Good) Abundant black pepper, toast, orange rind, balsamic, and perhaps the slightest whiff of Brett. The taste is straight down the fairway and chock full of pleasingly tart red fruit flavors. 39% Cabernet Sauvignon, 39% Cabernet Franc, 13% Grenache, and 9% Syrah. Canoe Ridge Vineyard. 14.1% alcohol. Rating: ./+ (Decent/Good) An aromatic wine marked by white peaches and white flowers. Round and fleshy on the palate. The alcohol bleeds through a bit. 100% Viognier. Desert Wind Vineyard. 91.5 percent stainless steel fermentation; 8.5 percent barrel fermentation (60 days new French oak); no malolactic fermentation. 14.5% alcohol. 414 cases produced. Sample provided by winery. Rating: . (Decent) An aromatic nose with honeysuckle, peaches, white flowers, and banana. A full and somewhat fleshy feel on a palate that has a viognier-like feel. A bitter note on the finish. 60% Chardonnay, 20% Riesling, 15% Semillon, and 5% Gewurztraminer. 92% fermented in stainless steel; 8% fermented in oak barrels. 13.8% alcohol. Sample provided by winery. Rating: . (Decent) Red fruit, aged fruit, pencil lead, herbal notes, and a bit of a nut aroma. Also shows a fair amount of alcohol. Palate shows cranberry flavors and has a pretty strong bite in the mid palate. Tannins are a bit atringent. 47% Cabernet Sauvignon 43%, Merlot, and 10% Cabernet Franc. 13.6% alcohol.